Researchers at Boston Dynamics have designed one of the most advanced humanoids ever to compete in DARPA's upcoming Robotics Challenge. But NASA's Jet Propulsion Laboratory is taking a decidedly different, and more primitive, approach. 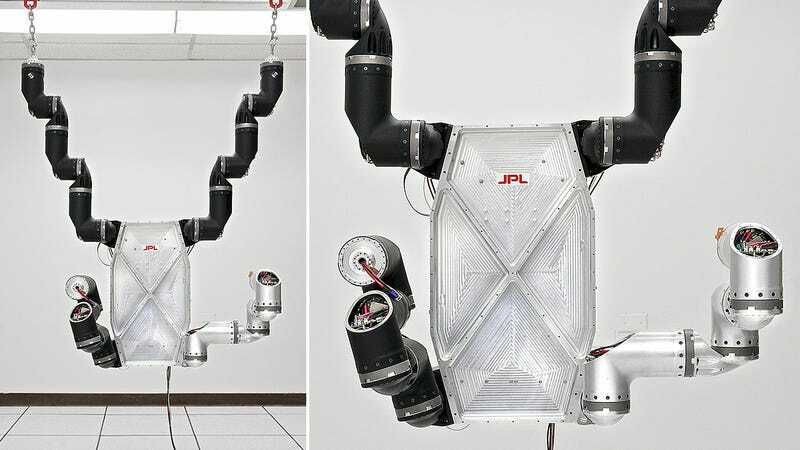 Like with the country's first space explorers, NASA is once again turning to primates with its surprisingly capable RoboSimian. Designed to mimic the posture and movements of a primate, the bot would primarily be used for search and rescue operations. And if you've ever seen footage of a chimpanzee or ape clambering through the thick jungle, it makes sense that a similarly capable robot could navigate a disaster zone with ease. Furthermore, with no defined front or back, it doesn't matter if the robot gets flipped around or knocked over, it will always be oriented the right way.